Earlier waves of travel and expense (T&E) audit technology largely automated elements of the manual review. For example, audit functionality would flag all expense reports above $2,000. It would also flag reports that lacked detail about attendees at business meals. While this made aspects of the T&E review faster, it did nothing to elevate the overall effectiveness of the review to better identify and prevent key T&E risk, such as fraud, waste, and misuse. It simply flagged reports for review based on various criteria, resulting in hours spent scanning reports that pose no problems whatsoever. Now, artificial intelligence and machine learning are transforming the industry and reshaping best practices. Organizations can now fully automate report review and focus exclusively on remediating transactions that have been identified as problematic, no longer wasting time searching for non-compliance. Not only can AI drastically reduce the time you invest in T&E controls, it can also automatically detect broader areas of risk than any individual auditor ever could. With the power of AI, automated expense audit solutions can run thousands of tests in parallel across your entire T&E data set. Instead of manually auditing one expense report at a time, AI solutions like Oversight Insights On Demand® analyze the entire data set, reviewing all transactions by an individual traveler and comparing them to all other employees across all time. Based on our analysis of $1.9 trillion in annual spending, Oversight has found that about 5% of employees generate 95% of all high-risk activity in T&E programs. Unfortunately, this group of repeat offenders goes largely undetected with current-state controls, which aren’t designed to detect patterns of high-risk activity. 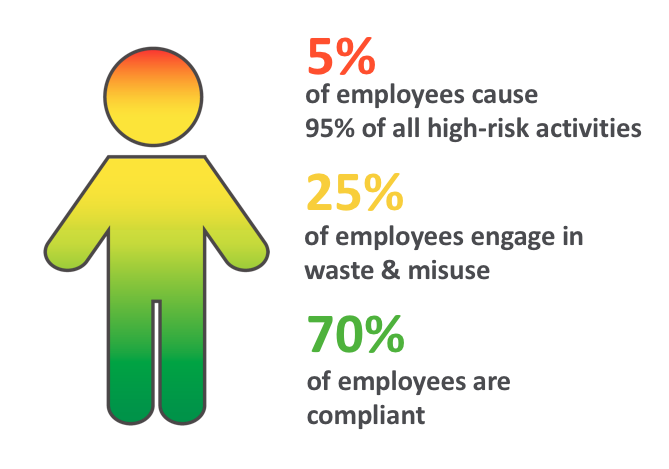 In any given program, we observe 25% of employees engaging in waste and misuse. These generally aren’t bad employees and they’re certainly not committing fraud. But they’re not good stewards of your corporate T&E spend. 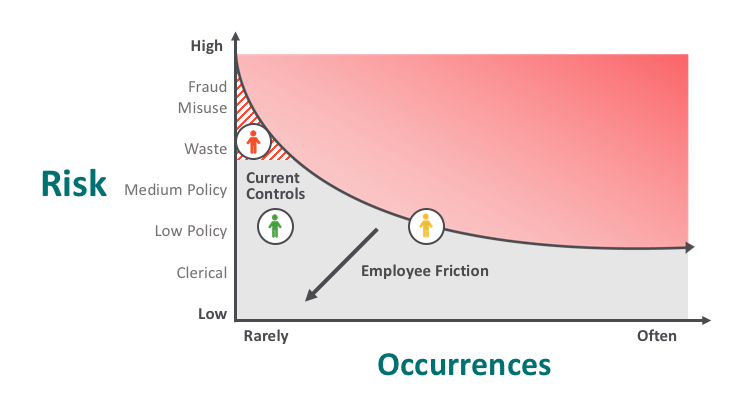 Lastly, about 70% of employees follow your T&E policies to the letter. These are your model citizens. Designating minor policy violations as lower-priority items. For example, an otherwise model business traveler exceeds a meal expense. In most cases, a one-off case like is a legitimate exception to your policy that you would probably approve anyway. Acting on a transaction like this creates unnecessary work for your staff, while resulting in unnecessary friction with employees who are otherwise model business travelers. Flagging patterns of moderate-risk transactions. Frequent violations by travelers who habitually go outside policy increase risk for your business over time. By using automated policy reminders, you can stop waste and chronic misuse before it escalates into costly abuse and fraud. Oversight clients have used this approach to reduce T&E policy violations by an average of 70% within the first year. Detecting high-risk exceptions that demand immediate attention and corrective action. These exceptions represent only about 2% to 4% of all transactions, but they largely go undetected with current state controls. Substantially reduced audit workloads. AI automates the task of searching for fraud and non-compliance. As a result, your team can focus on remediating problems, instead of trying to find them. Most Oversight customers reduce their auditing workloads by 50% to 90%. Expanded risk coverage by detecting costly waste, misuse, and fraud in your T&E spending. Minimized employee friction. Oversight lets you spend your time educating the 25% of employees with wasteful spending habits and remediating the 5% of high-risk repeat offenders. By focusing on problematic spending by these groups, you avoid irritating the 70% of employees who typically comply with your T&E policies. This is part 2 of a two-part blog series based on the Oversight webinar, Leveraging AI and the Power of Patterns to Transform Your T&E Audit Process. Part 1 focuses on Why Your Expense Audit Process is Broken, and How to Fix It. Chris Elliott is a senior solutions consultant with Oversight Systems.